If you don’t already subscribe to Consumer Reports, you should. I have been a subscriber for as long as I can remember. I get the magazine in the mail and also subscribe online. I rarely buy any product without consulting this great magazine. I subscribe to the online edition because it’s even more current than the regular magazine, and I get many consumer tips via email. I recently received their annual auto issue, which no car buying family should be without. All libraries would have this on hand. Don’t be fooled by other magazines with similar names purporting to objectively analyze and recommend products. There is only oneConsumer Reports. They do not accept any advertising and therefore are not beholding to any companies. They even go beyond this and will not allow a retailer or manufacturer to use the name Consumer Reports in their advertising. Even if Consumer Reports gives a product a great rating, that company cannot mention this in their advertising. If they do, they get sued by Consumer Reports. No other company goes this far and is this “squeaky clean”. J.D. Powers is a company that ranks and compares lots of products including cars, but they allow companies to use the JD Power name to advertise their products when they rated them good. You can understand why a consumer might be just a little more skeptical of J. D. Powers’ objectivity than Consumer Reports’. You should ignore car enthusiast magazine like Motor Trend and Car and Driver that write articles on the “Car of the Year” and other articles praising various makes and models. You can be sure that these car manufacturers with the great articles are spending lots of money advertising in these magazines. I am not saying that Consumer Reports is infallible. They do make mistakes and they have been successfully sued by some companies that were affected by their mistakes in testing. But this is very rare. As a car dealer for almost fifty years, I have not always liked what I read about all of the makes and models of cars I have sold, but I grudgingly had to admit that the reports were almost always accurate. Issues of CR recently gave negative reviews to models of the cars I now sell, Toyota. I must confess that with some makes and model cars I have sold over the years, I was very thankful that the circulation of Consumer Reports is not very large. Their circulation is growing as consumers become more educated and sophisticated. This annual auto issue should be a mandatory read before you buy your next used or new car. Here are some of the articles in this issue…Top Picks (the best new vehicles they have tested), Best and Worst (tells you the ones you definitely shouldn’t buy), Coming for 2018, Who Make The Best Cars (best manufacturers), Buy Better on the Web (The Internet is the best place to buy your next car), Reliability trends (repair histories on all makes and models), What’s Next in Auto Safety, and Used Cars, Best and Worst. 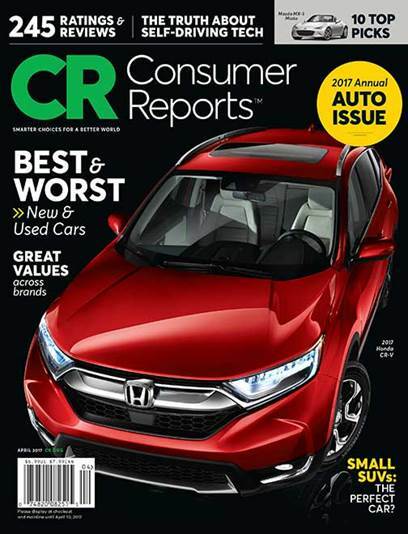 Consumer Reports also offers other car buying services like their “New Car Price Service” which discloses the best price you should expect from a dealer, rebates and incentive information, negotiating strategies, and their expert recommendations. They also offer a “Used Car Price Service” which provides an evaluation tool kit that helps you establish the right price for most used cars. A letter addressing the critical issues associated with the sale of used vehicles equipped with recalled Takata airbags was written just over one year ago, and I’ve received no reply; It was also published as a full page ad in Governor Scott’s hometown newspaper, the Tallahassee Democrat. In the last several weeks, TWO MORE FLORIDIANS were killed by exploding, defective Takata airbags, and it is inevitable that the toll of deaths and serious injuries will continue to rise as long as the sale of used cars equipped with defective Takata airbags continue. While I argued last year for laws specifically requiring dealers to disclose outstanding safety recalls, it is now clear that the only effective way to address this problem is to extend the ban that already applies to the sale of new cars subject to safety recalls to include used cars as well. Indeed, the nature of the Takata defect is such that the older the car is, the more likely it is that the airbag inflator will explode. So I am writing once again with a renewed sense of urgency, and I not only call for action by the Governor, but I also ask every car dealer in this State to consider the dire consequences of continuing to sell used cars with defects that can kill and maim their customers and every other passenger in the car they are putting on the road. Governor, please read my letter and call me at 561 358-1474. Please excuse this public form of communication, but I chose it because my message is urgent and I believe it will get your attention faster than going through the normal, bureaucratic channels. Florida law not only fails to expressly ban the sale of used cars with unremediated safety recalls, there is no Florida law that even specifically requires a car dealer to disclose national safety recalls on used cars sold to their customers. This has always been bad, but considering the unprecedented Takata air-bag inflator recall (currently affecting 75 million vehicles in the U.S. and rising), this legal loophole presents a problem of critical magnitude. And efforts to address the problem with disclosure requirements, while certainly better than nothing, do not go nearly far enough in safeguarding consumers from the lethal timebombs hidden in their steering wheels. I communicated my position directly to the Florida Automobile Dealers Association over a year ago, and they are aware of this serious omission in Florida’s laws. Unfortunately, legislative action, as you well know, is always a slow process if it ever happens at all. 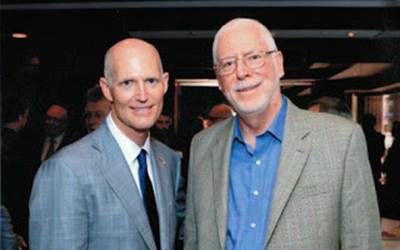 What is required in this case is an emergency executive action by you, the governor of the state of Florida. I can assure you that very few Florida automobile dealers are voluntarily disclosing safety recalls affecting the used cars they sell, and even when some form of disclosure is made, it is never adequate to properly alert purchasers to the danger posed by exploding airbags. As I write this letter, there are Floridians unknowingly buying cars with defective Takata airbag inflators that could possibly explode on impact, firing metal shrapnel into their bodies. There have already been several deaths across the country attributed to these faulty inflators. It is a certainty that nearly all car dealers in our state have vehicles in their current inventories with these defective airbags and other safety recalls. I have identified sixteen in my used vehicle inventory that are affected. It’s a simple matter to identify these vehicles by entering the VIN online at the NHTSA website, http://www.nhtsa.gov/Vehicle+Safety/Recalls+&+Defects. The sad fact is that most dealers don’t check these vehicles for recalls because it takes time to have the recalls performed and “time is money”. Recalls can only be performed by franchised new car dealers of the make that is recalled. Franchised car dealers prioritize recalls for their inventory cars and for their customers’ cars. They are also dealing with long waiting lists of these cars awaiting the requisite parts. With the Takata airbag inflator recall, the wait time is about about a year because of the lack of availability of parts. Letting a used car sit on a dealer's lot for a year is a cost that few dealers will be willing to incur unless the law expressly requires it! Sadly, another reason safety recalls are not being disclosed to customers is fear of loss of profit. As it should, telling a customer that they are buying a used car with a potentially deadly defective airbag reduces the value of that vehicle - especially when the customer learns he or she must drive that car for a year before a safe airbag can be installed. Because disclosure negatively impacts the affected vehicles' values, car dealers are caught between a rock and a hard place. If they attempt to retail the cars to fully informed customers, they have to slash the selling price and if they sell them at the wholesale auction they have the same problem. Florida consumers will also be adversely affected, as car dealers will not be able to offer as much money for trade-ins under this recall since the dealer knows he or she can’t resell it for as much as they could with a safe airbag. This presents an entirely new and different problem…an economic liability question. Everyone agrees that Takata is largely responsible for the reduction in value of the 75,000,000 vehicles with dangerous airbags. However, Takata is on the verge escaping responsibility through bankruptcy and/or selling out. This leaves the auto manufacturers with, potentially, all of the liability. The only parties that clearly have no responsibility in this are the owners of these affected cars and the dealers who either do not sell Takata airbag equipped vehicles at all or who properly disclose the defective airbags, the full extent of the danger they present, and the difficulty involved in correcting the defect when replacement parts are unavailable. Unfortunately, honest dealers and uninformed purchasers are the only two parties that currently bear all of the economic loss. Adding to the urgency of this crisis is the fact that the failure rate of Takata airbags is higher in Florida than most other states because of our high humidity which increases the risk of the airbag accelerant, ammonium nitrate, exploding. Furthermore, many of the cars recalled are older models, dating back to 2004 that have been on the highways for many years, and age is also a contributing factor to risk. Rick, if you have any questions or comments about this letter, please call me on my personal cell phone, 561-358-1474. If you would like to meet with me, I will fly to Tallahassee on a moment's notice. Before I get into the pitfalls, it is important for you to understand how important it is to have your car serviced per the manufacturer’s recommendations. The pitfalls and consequences of not doing so can be equal to or greater than those you might experience at the hands of an incompetent or unethical service department. I strongly recommend that you have your car serviced and repaired by a franchised dealer of the make of your vehicle. I know that this statement, coming from a franchised car dealer, may be met with some skepticism. Listen to my reasons before passing judgment. Modern vehicles are highly complex computerized machines requiring very sophisticated diagnostic equipment and highly trained technicians. The evolution of new, expensive diagnostic equipment requires constant updating. The evolution of car technology requires continuing education of dealers’ factory trained technicians who attend many weeks of schools every year. Forty years ago, it was possible for a good mechanic to fix anybody’s car. Those days are gone and your car needs a highly-trained specialist with the very latest diagnostic equipment. It is impossible for an independent service company to be competent in servicing and repairing all makes of automobiles. 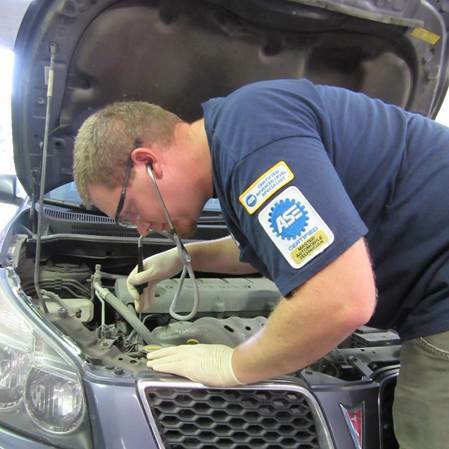 Carefully choose the dealership that will service your car. You don’t have to take your car to the dealership that sold you the car for warranty repairs, as many believe. Every dealership of your make car will welcome your warranty and non-warranty work. Do your homework on which dealer has the best service department. Every dealer is graded in customer satisfaction by the manufacturer. Ask to see a copy of his CSI (customer satisfaction index) scores. Be forewarned that service satisfaction surveys can and are manipulated by car dealers (offering a free tank of gas to let the dealer fill out your survey). Many auto manufacturers have begun measuring their dealers’ service competence by the percentage of service customer that return for more service. It’s usually called SERVICE RETENTION. If a high percentage of service customers keep coming back, that dealer must be doing a good job. Check with the BBB and the County Office of Consumer Affairs. You will find that prices for maintenance like oil changes, alignments, tire rotation and balancing, etc. are usually priced competitively. On many new cars manufacturers are offering free maintenance for 2 or 3 years. Where you have to be careful is in the pricing of major repair items like transmission, engines, and air-conditioners. When quoted a price on a big repair, don’t be afraid to negotiate. If you let it be known that you are willing to take your car elsewhere (even if you’re bluffing), you can often negotiate the price down significantly. Don’t be shy about asking for a loaner car when you have to take your car back a 2nd or 3rd time for a repair that was not done properly. It’s the dealership’s fault and you should not be inconvenienced. On a comeback, always talk with the service manager directly. Be very careful that you really speak to the real service manager. Service salesmen are not managers. They are commissioned salesmen but they often identify themselves as service managers or assistant service managers. Also ask that they assign their best technician to the job. The technician that works on your car should have a few years’ experience and be ASE (American Association for Automotive Excellence) certified in the area of the car he’s working on…transmission, air conditioner, engine, etc. Most car dealership and independent service departments will recommend “extra” maintenance not found in your car’s owner’s manual. You should be very skeptical of anything that your car’s manufacturer does not recommend. “Flushes” of the radiator and transmission are popular and expensive extras that are often recommended. A good rule of thumb is to “just say no”.